Over 76,130 Bottles sold throughout the UK and Europe. High Strength Premium Organic Turmeric in an easy to consume vegan capsule. Pure and Natural with Zero additives, fillers, flowing agents or anything else except 100% herbal ingredients! Batch tested for heavy metals and pollutants. Turmeric contains unique natural compounds called curcuminoids, including curcumin. Now you can enjoy all the benefits of organic turmeric in a high strength formula with maximum absorption into your body. More absorption means more benefits so you can easily experience the full effects of this amazing herb. We use the highest quality premium organic turmeric sourced from certified organic farmers in India. Organic foods have been shown to contain higher antioxidant levels and are grown using natural farming methods without the use of chemical fertilisers and pesticides that can find their way into your body. Why we add Ginger and Black Pepper. Despite its amazing health potential Turmeric is not easily absorbed by your body. The active compound Curcumin is quickly metabolised and excreted by your liver before it can enter your body where it’s needed. To combat this each capsule includes the optimal proportion of Organic Ginger and Black Pepper to help you get the maximum absorption and bioavailability. Don’t waste your money on low-quality supplements as turmeric is notoriously difficult for your body to absorb. + Piperine in Black Pepper assists with the absorption of curcumin and has been shown to increase its bioavailability by 2000%. + Ginger is from the same plant family as turmeric and shares many of its properties. When taken with turmeric it can assist with its digestion and absorption. Shop with us today and experience the Turmeric Vitality difference! 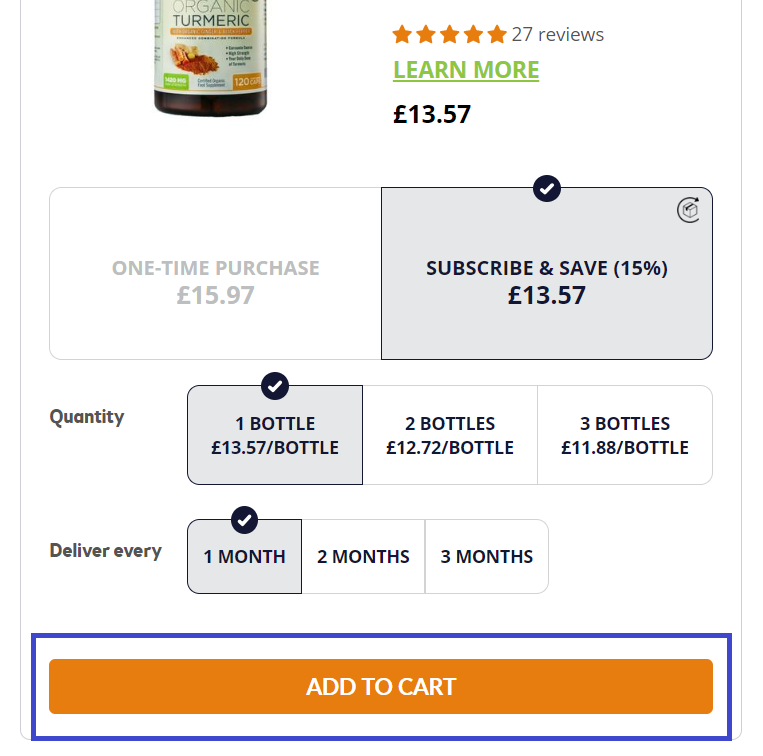 Try our organic turmeric capsules for 30 days and you're protected by our no risk money back guarantee if you’re not satisfied. There’s absolutely no-risk in giving them a try. No questions asked, you can get your money back! Turmeric is a natural herb commonly grown throughout India and parts of Asia. It comes from the rhizome of the curcuma longa plant and contains unique natural compounds called curcuminoids, including curcumin. It has been used in Eastern cultures throughout history and is now becoming the fastest growing nutritional supplement around the world with millions of people supplementing it into their diets. Ginger is botanically related to turmeric and shares many of it's nutritional properties. When taken with turmeric it can assist with its digestion and aids in the absorption of nutrients. Black pepper naturally assists the absorption and bio-availability of curcumin as well as other nutrients such as Vitamins C. Piperine is the compound within black pepper that is responsible for its absorption enhancement and studies have shows it can increase the Bio-availability of curcumin by 2000%. Bioavailability refers to the amount of nutrients that are biologically available for your body to use. 2. Choose your desired quantity per delivery. 4. Click the "add to cart" button to complete your order. 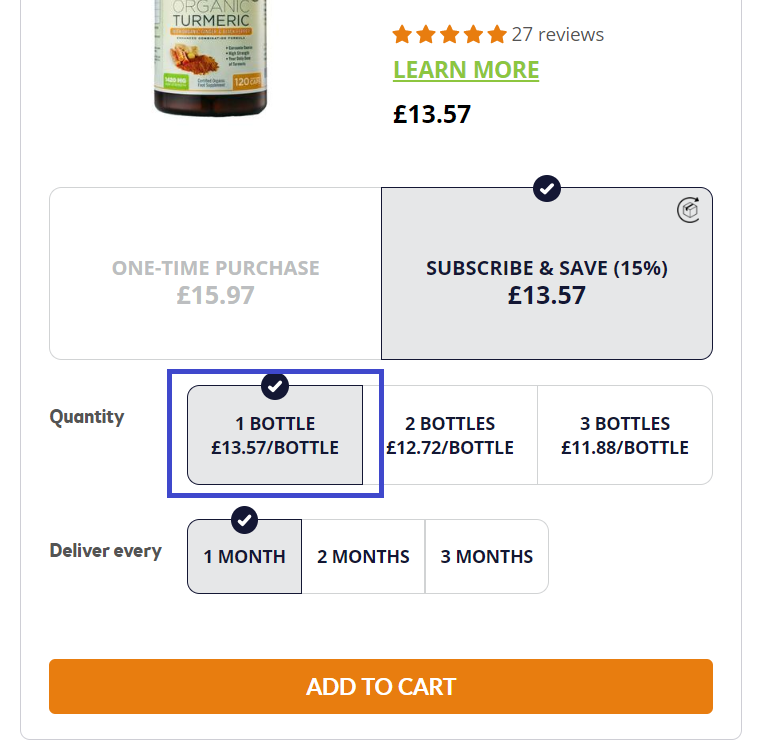 You have total control over any subscription you make and can log in using the steps above and cancel any order at any time. Or if you prefer you can reach out to us directly at info@turmericvitality.co.uk and we can cancel any subscription for you. 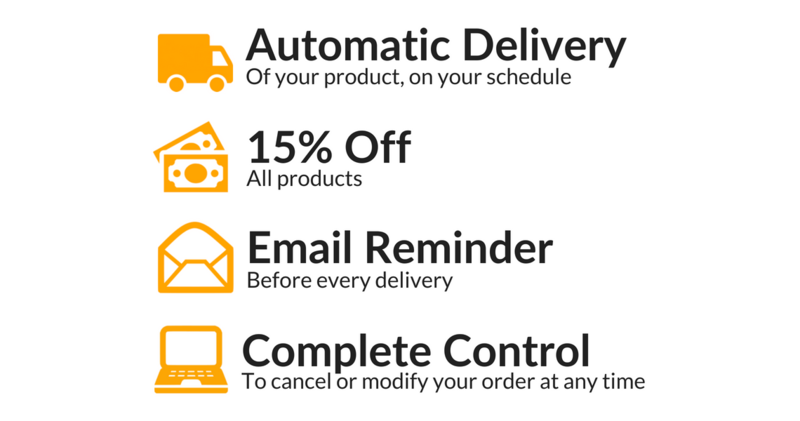 Before each shipment, we will send an e-mail notification to let you know your next order is being processed so you can make any necessary updates if needed. 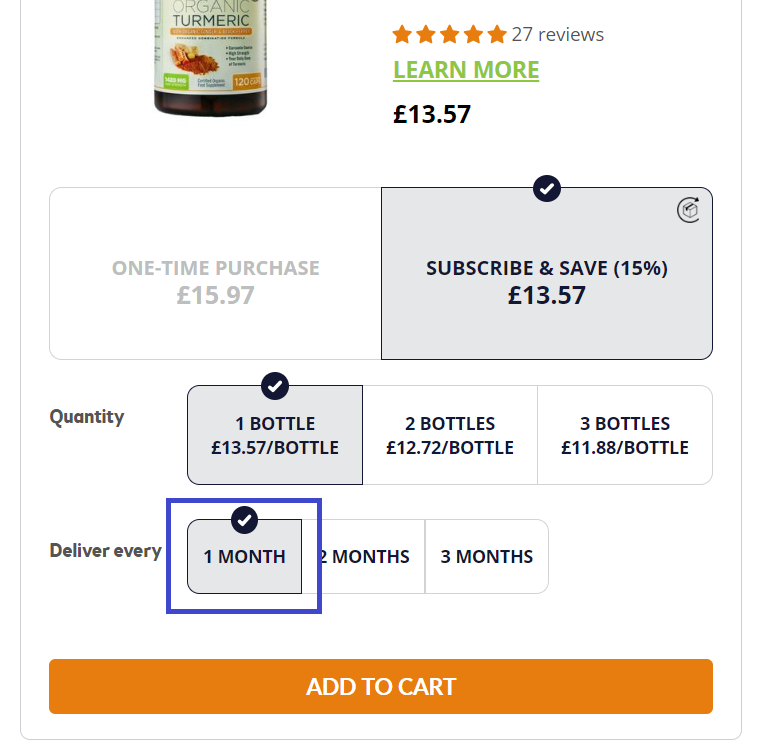 To adjust your delivery date follow the steps above; log into our website and edit the appropriate subscriptions delivery schedule. 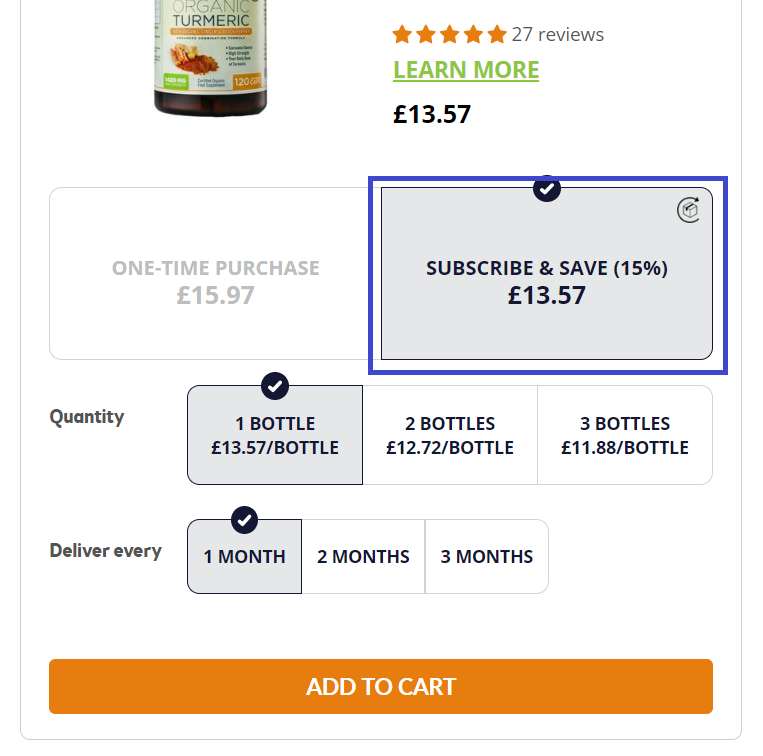 This subscription service is exactly as presented and has been created to make it easy for you to get your daily Turmeric dose. There is no contract; you can cancel any subscription at any time. Take 2-4 capsules daily with food or as directed by your healthcare professional. Four capsules per day is equivalent to consuming one teaspoon of turmeric which is amount commonly used in many asian dishes. If you need to contact us with questions, feedback, testimonial or a suggestion, please send an email to info@turmericvitality.co.uk. All emails are typically responded to within 24 hours, except weekends. I made golden paste, but found it gave me the most awful indigestion and heartburn. Taking these capsules gives me no problems at all, so I am able to have my daily turmeric. Good service too! Thank you. This Turmeric is the real deal -by far the best I have tried & having this one with the added black pepper is really helping my back pain -thank you!